•In excellent condition. Completely restored. •Dimensions :Hight: 73 cm, Width:67 cm; Depth:53 cm; Seat hight: 41cm. 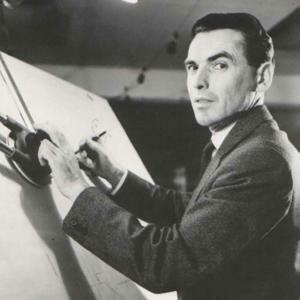 Dutch designer Cees Braakman was born in Utrecht in 1917. At the age of 17, he began working at Pastoe, a Utrecht-based furniture manufacturer, where he learned the trade. His father, D.L. Braakman (1885-1966), was then the company’s head draftsman and manager. In 1948, following the Second World War (during which time the factory was dismantled), Braakman followed in his father’s footsteps, taking on the role of Pastoe’s manager and designer, where he would remain until 1978. Pastoe’s story began in 1913 in Utrecht, when German-Dutch businessman Frits Loeb (1889-1959) decided to produce chairs in a traditional cabinetmaking workshop to sell in his own shop. His atelier—named Utrechtsche Machinale Stoel-en Meubelfabrik (UMS) at the time—quickly grew and in 1917 moved into a large factory facility, manufacturing furniture for a range of retail outlets. In 1918, the factory was moved again to the Rotsoord area in Utrecht, where it is still located today. While the early furniture lines produced by UMS were intended for a general audience, the company—under the direction of designer-manager D. L. Braakman (1885-1966) -was one of the first in the Netherlands to adopt a more austere, minimalist aesthetic expressed in then-novel materials like tubular steel and bent plywood. The Dutch market was slow to respond to these designs, so it was all the more audacious when UMS, in 1947, became dedicated to producing only modernist furniture. To reflect the new mission, the company’s name was changed to Pastoe. Today Pastoe continues to manufacture formally simple, high-quality furniture, including cabinet systems, storage pieces, chairs, and more. Many of Pastoe’s designs have attained an iconic status, such as Cees Braakman’s SMO5 Chair (1958), one of the first stools to be entirely fabricated in steel wire, and Studio Pastoe’s L-Series Cabinet (1979). Recent collaborations include projects with the late, great Belgian designer Maarten van Severen and rising-star Dutch studio Scholten & Baijings. Pastoe’s objects have been exhibited in galleries and museums broadly, including the Centre Pompidou in Paris, Museum of Modern Art in New York, Louisiana Museum of Modern Art in Denmark.